Successfully Added Lenovo K80M Android Smartphone - 4G, 5.5 Inch IPS Screen, Intel Z3560 CPU, 4GB RAM + 64GB ROM, Bluetooth 4.0 to your Shopping Cart. Check out the K80M from Lenovo - A 5.5 inch phablet with Intel Z3560 64 bit quad core CPU, 4GB of RAM, Android interface, Bluetooth 4.0 and more. Having long proved itself as a reliable manufacturer of cutting edge tech, Lenovo’s needs no introduction, their K80M smartphone is another top product - it is the perfect example of great design and efficient performance. First, take a look at the 5.5 inch IPS screen sporting full HD 1920x1080 resolution. The large screen offers a great platform for watching movies, browsing the web and more. With Android interface at your fingertips, you will have everything you need, including access to the Play Store. One of the highlights of the model is the massive 4GB of RAM. The phone is also powered by the 64-bit Intel Atom processor, so you will have all the power needed to multitask, play games and more. With Bluetooth 4.0, the phone efficiently communicates with other devices, so feel free to hook it up to smart watches, speakers, headphones and all your other gadgets. 4G Support ensures a stable connectivity and fast web speeds, so you can download anything easily, work on-the-go, make Skype calls, browse your social media and more. With NFC support, you will be able to quickly transfer files to other devices or take command of your smart wallet. There is even a built-in LED flashlight which will be a great guide when its dark outdoors. All in all, the Lenovo K80M has all it takes to win over users worldwide. With loads of features and a comfortable price tag, it’s a great model from one of the top manufacturers. 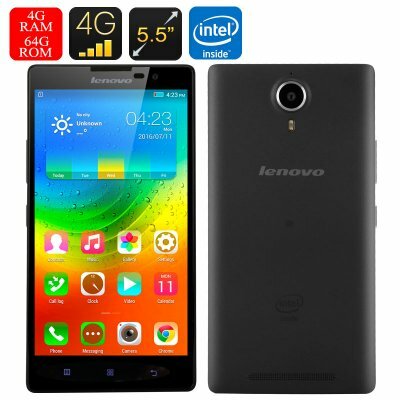 The Lenovo K80M Android Smartphone comes with a 12 months warranty, brought to you by the leader in electronic devices as well as wholesale Android Phones..